On Sunday 11th of September Verdon College hosted the annual Southland Schools Debating Competition. Students from Verdon College, SGHS, SBHS, JHHC and Aparima College made up the 81 competitors. Six members of the Otago University debating team headed the adjudicating team. This year the competition was sponsored by the ILT who helped with the accommodation of the visiting adjudicating team. As well as some local legal firms—Scholefield Cockroft Lloyd, AWS, Cruickshank Pryde and Hewat Galt sponsored prizes for the winning teams. 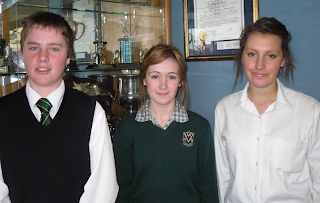 Verdon College had four teams competing in the Southland Secondary Schools Debating Competition. All teams won at least one debate, the Year 10 team (Jack King, Henry More and Gabe Winders) made the semi-finals. The Year 11 Team of Ella Prendergast, Josef Winders and Sarah Hughes won the year 11 section with Sarah Hughes being named Best Speaker. A special thank you to the PTA who provided a wonderful morning tea and lunch for the adjudicators and teachers. The school was widely complimented on the wonderful facilities and hospitality.